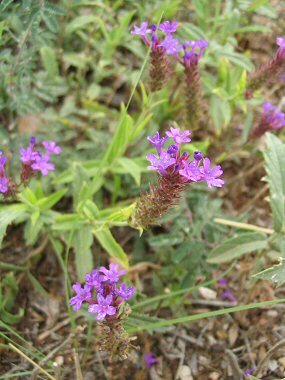 Sandpaper Verbena is a member of the Verbena or Vervain Family. The plant grows to a height of about 2 feet and has rough, dark green leaves which grow to 2 inches long. Sandpaper Verbena is native to Brazil and Argentina, but has become naturalized across the midwestern and southwestern US. The plant blooms between spring and fall and produces a cluster of purple flowers which have 5 rounded petals to 1 inch wide.